It was a little over two years ago that I received a promo for an emerging UK pop-punk band from Leeds called, Eat Defeat. Their release "Time & Tide" impressed me due to its almost separation from the norm of common UK pop-punk in recent years. 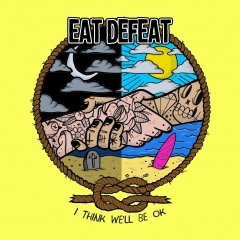 Elements of skate punk made Eat Defeat different from their peers, removing the over cheese influences in their style and making them stand out as a band with some real oomph to them. Since then, I have watched this band grow, being put on bigger festivals and put on lineups with bigger bands, such as Teenage Bottlerocket earlier this year. Now the Leeds crew have unleashed their debut album, “I Think We'll Be OK”, one that shows further growth in musical and lyrical songwriting. This is an album, that like their UK punk friends Call Me Malcolm did earlier this year on, “I Was Broken When You Got Here”, touches on the topics of depression, and mental health, looking at ways to feel ok when you are at a low. This is made apparent from the opening song, “A Little Less Than OK”, that while the topics aren’t about happiness, it’s a top degree uplifting pop-punk anthem that is designed for summer. 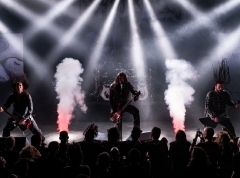 The riffs and beats are bouncy, the vocal melodies are perky and the chorus is so catchy it’s the ultimate leading song to kick you off into party mode. “Duvet Day” then comes in with a similar mood of when battling depression, all you want to do is stay in bed. However, the song itself is a short 42-second burst of high tempo pop-punk and skate punk blend that is incredibly reminiscent to early Sum 41, down to the “Get FUUUUCKED” lyrics repeated towards the end. While previous material separated Eat Defeat from their UK peers, I sense to hint of getting closer to those influences that follow the American pop-punk scene, particularly Four Year Strong with Duvet Day, and it’s follow up, “Smile”, which carries on the uplifting bouncy vibes that started the album, but with an angst-ridden, raspy vocal melody that sounds very much similar to (insert vocalist names), right down to the big woah chants that are designed to have a crowd join in. The stand out tracks for me are the return of "Shortcuts" from the previous EP, which still stands to be quite possibly the best song that Eat Defeat have written to date, from the happy go lucky guitar melody in the intro to get any crowd bouncing, to the high tempo, pit inciting verse or the incredibly catchy chorus. “Self Help (For The Helplessly Selfless)” also has the same angsty energy, double-time beats and a guitar riff that makes you think of a mixture between Lagwagon and Blink 182, again matched with a chorus that screams sing along anthem, yet delivered with a tone that unleashes all the grit in Andrew Summers’ mind. 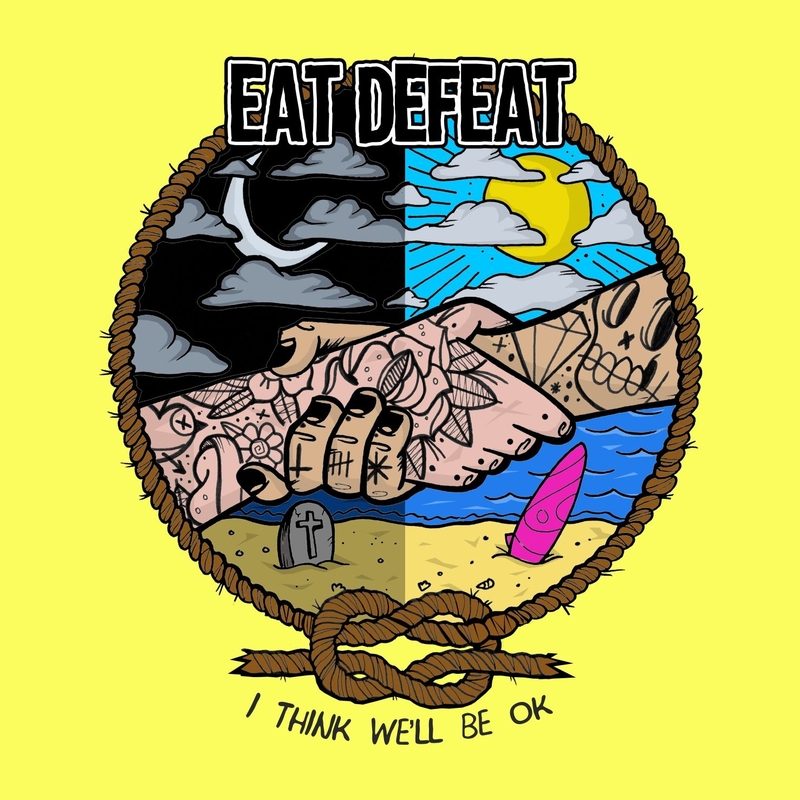 Eat Defeat have followed up their 2016 EP, with a fantastic debut album, one that really should be pushing the pop-punk crew up the pecking order in the pop-punk scenes across the country. “I Think We'll Be OK”, borrows elements from various pop-punk realms, the early 2000s, to the modern revival of pop-punk in the last four to five years and melodic skate punk. This release is a vast improvement for the Leeds outfit, one that has still caught me by surprise, even if I was strongly anticipating this release.